Last Friday I was at New York Comic Con.I saw a lot of people with eyepatches. But I’m not going to go into that here, because you can simply read my thoughts on eyepatches elsewhere. Suffice it to say, it’s a little frustrating to see able bodied people walking Very Slowly because they cannot see out of one eye. If you have to give yourself an actual disability in order to wear your costume, some rethinking might be in order. 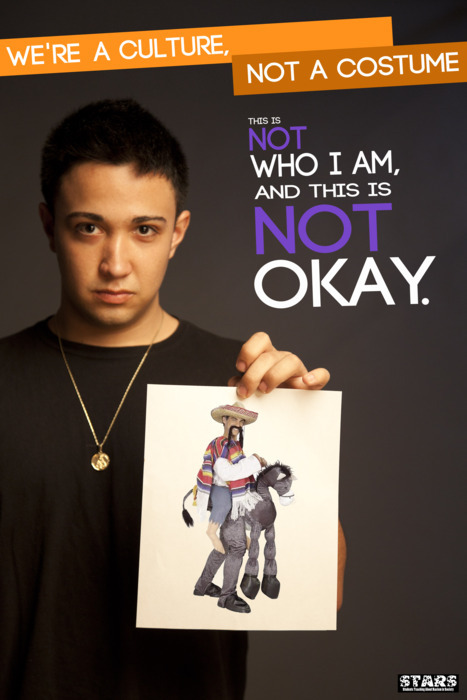 There’s a photo series that’s been floating around for a while, and the title is “This is my culture, not a halloween costume”. Cultural appropriation, making fun of cultures, confusing one culture with another, all of these are things that conflate together to make the choice of halloween or cosplay costumes super complicated. While I was at comic con, a couple of people assumed that my right eye was a special effects contact. There are two issues for me – there’s the issue of able bodied people playing disability dress up for fun, and there’s the issue of me not being able to put on a costume without people assuming that my eyeball is a part of my costume. Yes. I carry a fancy cane, but I do so because I want to be able to dress up and cosplay, and an actual white cane tends to take away from the whole effect of steampunk, or other costume choices for myself. Furthermore, it’s incredibly frustrating to know that if I were walking down the street on a regular Tuesday in April none of these people would come up and ask me where I bought my eyeball. Nobody would ask me whether it was real or not. It’s a symptom of the season, but since I love dressing up, I’d like to be able to do it with everyone else, and still be able to use my cane so that when I go wandering through thousands of people at a comic convention, I can do so in safety. Nerd culture seems to value my eye as something pretty, or awesome – but it would be nice if it could be ported out of the context of a super awesome costume into just being pretty because it is. Hey! I really loved this article, is it alright if I could contact you? All correspondence is handled through the contact form on the site.